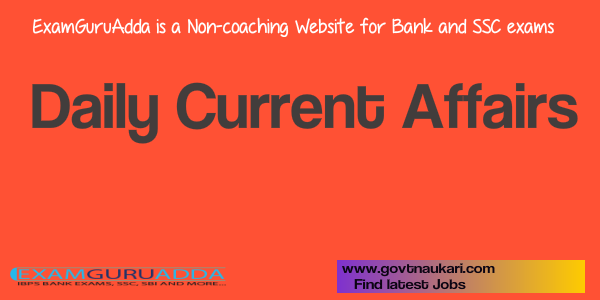 Dear Readers, we are presenting Today Current Affairs for All Exams- 13th April 2017. Daily Current Affairs and General Knowledge is very helpful for IBPS Bank Exams, SBI , RBI Assistant,NIACL, SSC and Railway Exams. 1. The World Bank has approved a $375 million loan to India’s first waterway project. The National Waterway 1 project is to create a water transport fairway on a 1,360-km stretch of the Ganga river between Varanasi and Haldia. 2. The project will help build the infrastructure needed to develop water transportation in the area. It will finance the construction of six multi-modal terminals, 10 RORO jetties, ship-repair facilities as well as passenger jetties along the river. It will also help modernise the ageing Farakka lock and add a new lock to allow for smoother passage of boats. The project will also help the Inland Waterways Authority of India acquire a state-of-the-art River Information System as well as navigation aids to make travel on the river safer and more reliable. 1. Jharkhand Police has initiated Tare Zameen Par programme to enlighten children in Naxal-affected areas in the Palamau district of Jharkhand. This programme is aimed to restore confidence in the state police force and to encourage children to lead happy lives. 2. As a part of the programme, the state police appealed the locals to donate bags, shoes, books and clothes to improve the basic amenities of the children in the Naxal-affected areas. 1. The Union Ministry of Labour & Employment has launched Aadhaar Seeding Application for efficient service delivery and widening the reach of Employees Provident Fund (EPF) benefits. 2. It was launched at the 217th special meeting of the Central Board of Employees Provident Fund (CBEPF/EPFO) in New Delhi under the chairmanship of Minster of State for Labour and Employment Bandaru Dattatreya. 1. President Pranab Mukherjee has given assent to four supporting legislations on Goods and Services Tax (GST). and The Union Territory GST Act, 2017. 3. The above bills were passed in Rajya Sabha on April 6th and in Lok Sabha on 29 March. Now with the President’s assent, these bills will pave way for the roll-out of GST regime from 1 July. 1. The Union government has constituted a time-bound inter-disciplinary committee to come up with an action plan for dealing with virtual currencies so as to fix the regulatory gaps in the existing framework governing virtual currencies. 2. The committee is required to submit its report within three months. 3. The nine-member inter-disciplinary committee will be chaired by Dinesh Sharma, special secretary in the economic affairs department. The committee will also have representatives from the Department of Economic Affairs, Department of Financial Services, Department of Revenue, Ministry of Home Affairs, IT ministry, Reserve Bank of India, NITI Aayog and State Bank of India. 1. Akhilesh Das Gupta, President of Badminton Association of India passed away following a massive heart attack in New Delhi. He was 56. 2. He had first become the BAI President after the arrest of former chief VK Verma over charges of corruption in Commonwealth Games 2010. 1. Saudi Arabia raised $9 billion in its first global Islamic bond issue, the government announced . 2. The sale of Islamic bonds, known as sukuks, comes after the kingdom in October turned to the conventional global debt market for the first time, raising $17.5 billion in a bond issue. 3. Saudi Arabia has also sold domestic bonds and drawn on its accumulated reserves, all in an effort to reform the economy and address budget deficits caused by a collapse in oil revenues since 2014.